Stop at Grand Hotel Europe to discover the wonders of Baku. Featuring a complete list of amenities, guests will find their stay at the property a comfortable one. 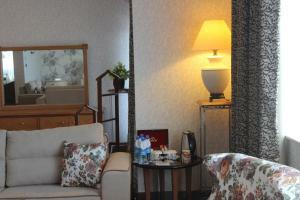 Luggage storage, room service, meeting facilities, business center, babysitting are there for guest's enjoyment. Guestrooms are designed to provide an optimal level of comfort with welcoming decor and some offering convenient amenities like air conditioning, heating, wake-up service, desk, mini bar. Recuperate from a full day of sightseeing in the comfort of your room or take advantage of the hotel's recreational facilities, including hot tub, fitness center, sauna, outdoor pool, indoor pool. For reliable service and professional staff, Grand Hotel Europe caters to your needs.